In Shakespeare's As You Like It a banished Duke takes refuge in the Forest of Arden: "... and many merry men with him, and there they live like old Robin Hood of England. They say many young gentlemen flock to him every day, and fleet the time carelessly, as they did in the golden world." Already, here, Robin's world is arcadian. Shakespeare never wrote a play about Robin Hood. Ben Jonson began one but did not finish it. There are several short 'May Games' plays enacting the deeds of Robin and his associates, but in these he has been transformed into a mythological 'Green Man', or 'Robin Goodfellow' figure for the games. In that sense perhaps Shakespeare did write a Robin Hood play in Midsummer Night's Dream. Some think these later dramatic pieces take Robin back to his origins as a forest god. Perhaps. But the Robin Hood of the earliest surviving ballads has neither an arcadian nor a mythological aura about him; rather he functions as a contemporary hero. Langland captured the sense of him from the point of view in the fourteenth century with the character Sloth who cannot recite his pater noster "but can rymes of Robyn Hode". 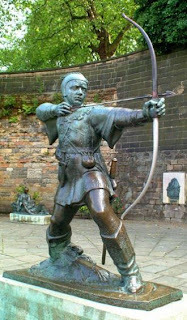 This early Robin Hood was not the dispossessed aristocrat that I grew up with watching the TV series. That idea came from Anthony Munday another late playwright who made him the Earl of Huntingdon. Robin in the ballads is quite specifically a yeoman. Not part of the Anglo-Saxon resistance to the Normans but a plain outlaw. Inhabiting in most of the ballads Barnsedale in Yorkshire rather than Sherwood. Devoted to the Virgin Mary he nevertheless persecutes the monks of the powerful St Mary's Abbey in York. He lives in the reign of one of the Edwards rather than Richard I or John. And there is no Maid Marian or Friar Tuck until much later. Though his sydes gan to smerte. Under the grene wode tree'. I wolde nat longe dwell her'. An inch above the buckle. A wagger of ballockes when other men slepes. For my lady and I will daunce in the myre for veri pure ioye.